KANSAS CITY, Mo. 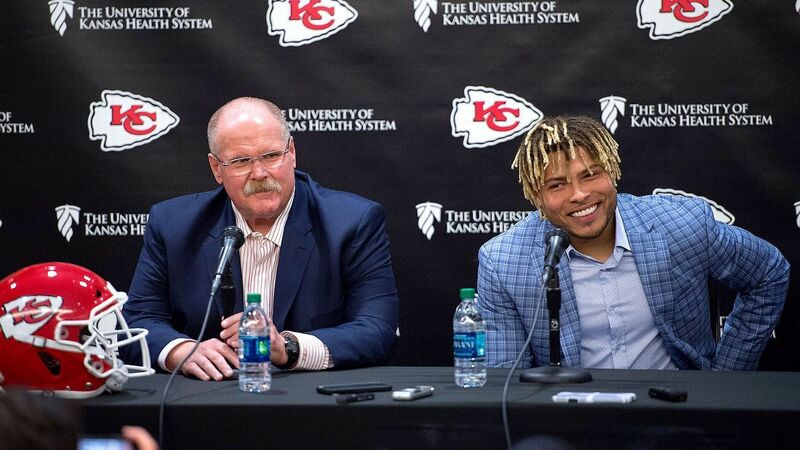 — One by one, the pieces are falling into place as the Kansas City Chiefs attempt to overhaul their defense in one offseason. Breeland Speaks and Alex Okafor are — at least for now — their new edge pass-rushers, replacing the productive Justin Houston and Dee Ford. Damien Wilson is a new starting linebacker. Safety Tyrann Mathieu is the anchor at the back end of the defense, where he’ll be asked to be the new Eric Berry. There’s plenty of work still to do on defense, particularly in the secondary, where the Chiefs have Mathieu, cornerback Kendall Fuller and plenty of uncertainty. Last season the Chiefs finished 31st in yards allowed per game (405.5) and 24th in points allowed per game (26.3), and their season ended when Patrick Mahomes and the Chiefs’ high-powered offense could only watch as the New England Patriots marched down the field in overtime to win the AFC Championship Game. But general manager Brett Veach says he feels strongly this is the way for the Chiefs to go if they’re to make significant improvement, even if it meant releasing two long-time stars in Houston and Berry and trading Ford, a former first-round draft pick who emerged as a top pass-rusher last season. The Chiefs lost a lot in terms of talent and experience. But they cleared about $39 million from their salary cap, which will allow them to find players like Mathieu, Wilson, Okafor and others who are better fits for their new 4-3 base defensive scheme. They’re also hoping to re-sign some of their younger stars to contract extensions. That’s why they had to resort to a bidding war and give Mathieu a three-year, $42 million contract to get him to sign. “You can acquire as many great players and as many talented players as you like, but until you have the catalyst to make it go, things will never work out the way you want them,” Veach said. “This was the catalyst we had to have. The Chiefs plan to use Mathieu’s versatility by lining him up in a variety of spots. “[Mathieu gives the Chiefs] a tremendous amount of flexibility and I know [defensive coordinator Steve Spagnuolo] will use all of it,” coach Andy Reid said. “It presents problems [for the opposing offense]. You’ve got to know where he’s at. You have to know where he’s going to be and you kind of work the other side, go opposite. The Chiefs aren’t as prepared to play a game in the secondary. But the Chiefs have plenty of time to see that they are by the time the regular season rolls around. “It’s a long way until the opening kickoff in September,” Veach said. “[Player acquisition] never ends. There’s a window here coming up before the draft where things happen. Then there’s the draft. There are moves made during the draft and then after the draft.